There is a beautiful Talmudic discussion that I learned from my father found in Tractate Avodah Zarah 3a. This page discusses the scenario in which one comes before God begging to accept God’s Torah and be a part of the Jewish people. God, in return, asks for the observance of one mitzvah. It is as simple as that: do one mitzvah, one act, and just like that one becomes a part of the Jewish people. Which mitzvah did God choose? One would think the celebration of Shabbat or the observance of Kashrut, daily prayer, or the laying of tefillin. However, the one act that God asks one to perform in this text to express one’s renewal and devotion to the Divine is the building of a Sukkah! Ironically, the mitzvah on Sukkot is to dwell in a sukkah: to sit, eat, and yes, even sleep in a sukkah, but not to build a sukkah. Yet, we are taught that the first thing that we do after the break the fast on Yom Kippur is put the first nail into our sukkot. Why do we immediately begin building our sukkot after Yom Kippur — and why does the above text suggest that the building of a sukkah is the one act that God wants us to participating in? The building of the sukkah is a full body experience. There are few full body experiences and rituals in our tradition. Immersion in the mikveh (ritual bath) is an example of one such full body experience. When one leaves the living waters of the ritual bath one is in a way reborn, having entered a new state of spiritual purity. 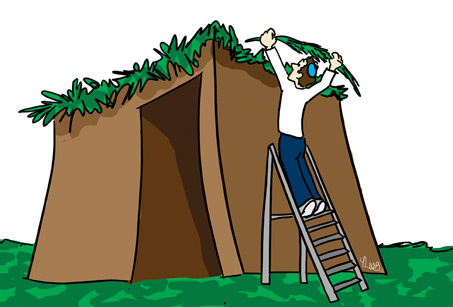 So too, on Sukkot, we build the sukkah to surround ourselves with God. We show that with our full selves, we are embracing God and community in the new year. The well-known midrash in Vayikra Rabbah 30:14 links the Lulav and Etrog, the four species, to different body parts. The palm branch represents how we praise God with our spines – through movement and physical labor. The myrtle branch represents how we praise God with our eyes – recognize and appreciating that all we see are God’s works and creations. The willow branch represents how we praise God with our lips – through song and speech, fixed liturgy praise and spontaneous prayer. Finally, the etrog represents how we praise God with our hearts — and how we strive to love God with all our heart. What is most powerful about this midrash is not the analogies. What is powerful is the fact that we do not shake these four species separately. The palm branch is meaningless to us without the myrtle and willow flanked at its sides, and the lulav is nothing without the etrog alongside it. Each represents another way we use our bodies to praise God, but we shake all four together as a sign of acceptance that we praise God with our full bodies and our full selves. We are truly made b’tzelem Elohim, in God’s image, and our bodies are sacred vessels. We use these vessels to reconnect with God and with ourselves. As we begin this New Year, we do not recommit a portion of ourselves to God. Rather, we recommit our full selves. May we rejoice on this holiday, and as we dwell in sukkot and shake our lulavim and etrogim, may we all be reminded that each of our bodies are living sanctuaries! Moadim l’simcha and Chag Sameach! Memory, the act of remembering, is the greatest benefit of the mind, the greatest gift that God has given us. The brain allows us to think, to deduce, to be creative, to be both rational and irrational. The brain gives us the opportunity to believe. Yet, all that pales in comparison to memory, the act of remembering. Truly, to remember is to relive. I enjoy collecting interesting newspaper articles that I come across. There was a brilliant article a few years ago in the Science section of the New York Times that speaks of a scientific breakthrough. The article said that for the first time, scientists have recorded individual brain cells in the act of summoning a spontaneous memory, revealing not only where a remembered experience is registered but also, in part, how the brain is able to recreate it. In essence, the article suggests that remembering is a lot like doing. Remembering is a lot like reliving. The brain associates a memory of a place, a moment, or an individual as if it is currently happening — as if you are in that place, experiencing that event. A memory is so powerful that your brain does not distinguish between past and present. Our tradition is filled with the power of memory. Only a couple of weeks ago, we read in Parashat Ki Tetzei: That we should remember what Amalek did not us on our journey! We should not forget! With regards to Shabbat, the Sabbath day, we are commanded: Zachor et Yom HaShabbat L’kodsho, to Remember the Sabbath day and keep it holy. We are not simply remembering. We are reliving. We are acting. For memory is more than just thought, memory requires a level of action. In this week’s Torah portion, parashat Ha’azinu, Moses is sharing his last words with the Israelites. In his final days, he shares with the people of Israel the importance of memory. Moses reminds us to ask our parents and our grandparents, our ancestors, to tell us stories of the past. Yet, when we are told these stories, we remember. Even if we were not there. We relive. We reflect. We re-experience. We actively remember. How appropriate then, that we read this advice as well, during the aseret yamei teshuva, during these Ten Days of Repentance, between Rosh Hashanah and Yom Kippur. We ask forgiveness of others, but really, we must ask forgiveness of ourselves. We should really call these the ten days of reflection. We look back on the year that has past, and we remember. We remember the good. We remember the bad. We remember those things that make us proud. And we remember those things that disappoint us. We refer to this past Shabbat, the Shabbat between Rosh Hashanah and Yom Kippur as Shabbat Shuvah. While Teshuvah is repentance, Shuvah, which shares the same root, means return. The first words of our Haftarah: Shuva Yisrael ad Adonai Eloheicha. Return, people of Israel to Adonai, Your God. We return to God. We do not TURN to God. We RETURN to God. We were once there and we left. We once knew our way, but we are now lost. We remember so that we can return – so that the moments of personal revelation felt during this season are not limited to just a couple of days, but rather become a constant in our lives. We take advantage of these opportunities to reflect and to remember. Because, as mentioned, memory leads to action. Remembering our past allows us to eeturn to God. Here is a video of Neshama Carlebach, the daughter of the late Rabbi Shlomo Carlebach performing this beautifully written kavannah. May we take advantage of this season, this opportunity to renew — to reflect and remember, so that we can together return to God, and return to better versions of ourselves.